Our mission is to create a racing team partnership that is affordable to all, so that people from all walks of life can enjoy the thrill of being an owner of a thoroughbred racehorse. ●We allow owners to join our stable from anywhere in the world. We currently have owners from the United States and the United Kingdom, Canada, Ireland and Scotland. All countries are welcome. ●The horses we purchase race within weeks of when we buy them unlike weanlings, yearlings and 2 year olds that have never raced. Therefore, you don’t have to wait months, years or never to see your horse on the track. ●As a partner in our Stable you will be an officially registered owner and will receive all horsemen perks including Winner’s Circle pictures and the ability to visit your horse and the backstretch when you are at the track plus free passes to the track on race day, stable visits, meet and greet the trainers. ●If you live near the track you can watch your horse race in person. If you can’t go to the track you will be able to watch you horse race right on the internet or at a simulcast outlet. ●We have priced our shares very affordable. By doing this we allow people with the desire to be a horse owner to experience ownership without a big cash outlay and risk. However, our program is for the experienced horseman as well. Those that want a bigger piece of the action only need to purchase more shares. ●With our stable there are no out of pocket monthly training or management bills. ●A percentage of all purse earnings (prize money for our UK friends) is returned to share holders every month. ●If you’re currently just a race fan you will love the thrill and excitement of being an owner, if you are an experienced horseman you are going to love the arrangement our stable offers you! ●As a Trans Atlantic Racing Stables partner you can follow the action from the inside as you access the Partners Only Area of the website where you get all the inside news on Trans Atlantic Racing Stables horses racing around the country. ●Partnerships currently available in West Virginia (Mountaineer and Charles Town); Southern California (Santa Anita, Del Mar, Hollywood Park); Northern California (Bay Meadows and Golden Gate); Massachusetts (Suffolk Downs); Pennsylvania (Penn National and Philadelphia Park); Kentucky - Ohio (Beulah, Churchill, Turfway; Illinois (Hawthorne/Arlington Park)and Texas. Coming soon to Louisiana, New York and a track near you! 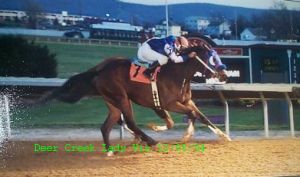 ●As of September 6, 2008, in just 46 months of existence Trans Atlantic Racing Stables has won 63 races and has purse earnings of over $800,000. We have hot streaks such as from July 7 to July 28, 2007, Trans Atlantic Racing has had 12 starts win 4 wins, 3 seconds and 4 thirds! We have won 4 races in a row with one horse! We have won 7 races in less than a year with another! It doesn't get much better than that! starting your own partnership or owning a horse by yourself! Options include Pay NO Monthly Bills or A Day Rate!! Buy your shares today and your horse will racing within weeks of when we purchase the horse!! All shares sold on a first come, first served basis. your heart will pound will excitement as you cheer your horse to the finish line. Let Us Add Your Country's Flag to Our Stable by Becoming a Partner Today! Let Us Add Your State’s Flag to Our Stable by Becoming a Partner Today! YOU’LL LOVE BEING A RACEHORSE OWNER! CONTACT US NOW! to our FREE Thoroughbred Racing related newsletter.